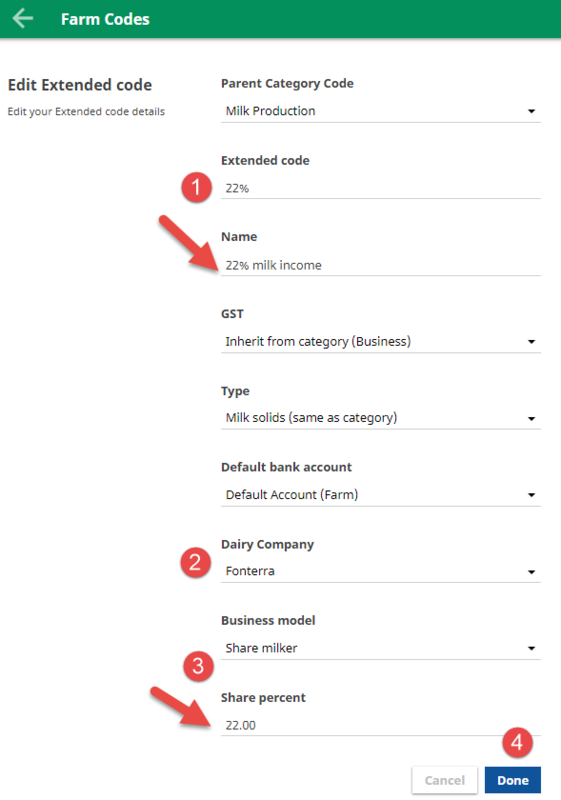 If you have multiple supply numbers that sit under one GST number; and you want to separate production for each, you’ll need to create an additional milk production code. This means you’ll have more than one dairy forecaster for estimating income. Kara sharemilks a total of 800 cows, 400 owned by herself and 400 by the farm owner. For the 400 cows she owns, she receives 50% of milk income and for the 400 owned by Greg, she receives 22% of milk income. So that she can keep the income from each separate, she uses two milk production codes. You can create a new code from anywhere in your farm business. Locate the category that you want to add an extended code to. Hover over the code and click on the three vertical dots. TIP: Creating a code this way saves time, as the Parent category code defaults to the category you selected. Enter a code abbreviation i.e. 22% and a Name i.e. 22% milk income. Select the Dairy company you supply. Select your Business model from the drop-down menu. If you’re sharemilking, enter a Share percent for your business. TIP: Make sure the Type displays Milk solids (same as category). This turns the dairy forecaster on for the extended code. 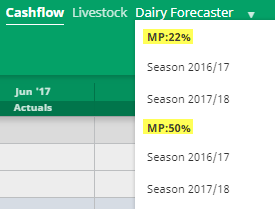 When you go to the Dairy Forecaster in the Plan screen, you’ll get to choose what forecaster you would like to look at.